If you are a 2nd or 3rd grade teacher looking for a FREE Thanksgiving math activity, try this November math challenge. The November math challenge freebie includes a math word problem printable focused on addition with multiple one and two-digit numbers to 25, a lined page for students to write about how they solved the problem, and an answer key, so you can just print & go! This Thanksgiving Math Challenge is perfect for your advanced 2nd and 3rd grade students. You can use this free printable for math centers, homework, problem of the week, a whole class number talk, small groups, math enrichment contracts, or to get a breather during a holiday party. It’s FUN for kids and NO PREP for teachers! The fall math freebie includes a “Leaf Piles” math problem focused on adding one and two-digit numbers, and logical thinking. Students are given the total number of leaf piles and are then asked to determine the number of piles each person raked using 3 mathematical clues. Students love the fun Thanksgiving/fall theme, and you’ll love how engaged they are with addition & problem solving. Download the free November Math Challenge HERE. Need more Thanksgiving and fall themed math challenges & brainteasers to engage your little turkeys all month long? 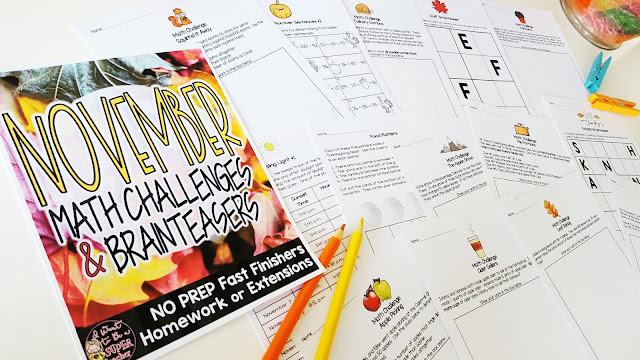 You can purchase 26 additional November math printables with Thanksgiving and fall themes HERE at the blog store. The printables pictured above are just a few from the November Math Challenge & Brainteaser pack. If you would like to have a set of 5 EXCLUSIVE math challenges + Super Teacher ideas delivered right to your inbox, please sign up for my newsletter to get exclusive freebies & super classroom tips to save you time and make learning fun!